The combination of increasing demand and high black market prices for rhino horn in Asian markets has fueled an escalation in rhino poaching since 2007, particularly in South Africa. This situation has in turn resulted in greatly increased rhino protection costs, loss in confidence by the private sector in rhinos, loss of revenue to conservation authorities and reduced rhino population growth rates. 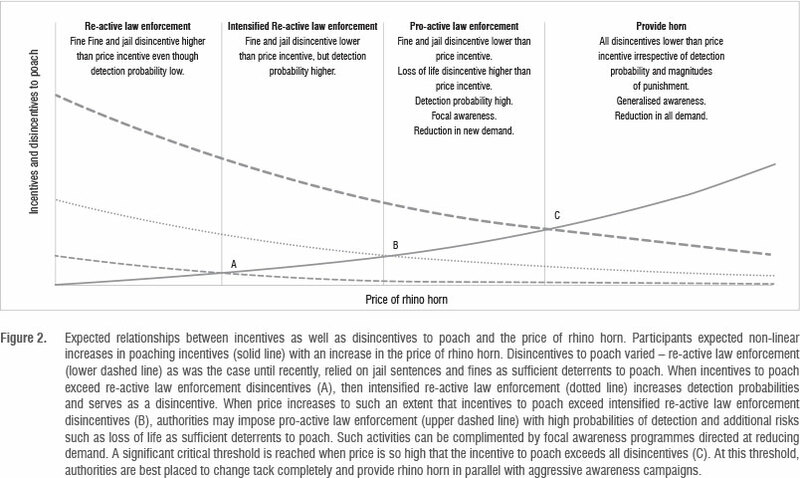 Within current CITES processes, management responses to threats posed by poaching to rhino persistence fall within a mixture of reactive responses of increased protection and law enforcement and some pro-active responses such as demand reduction tactics, along with a parallel call for opening a legal trade in horn. These rhino management strategies carry different risks and benefits in meeting several conservation objectives. An expert-based risk-benefit analysis of five different rhino management strategies was undertaken to assess their potential for delivering upon agreed rhino conservation objectives. The outcomes indicated that benefits may exceed risks for those strategies that in some or other format legally provided horn for meeting demand. Expert risk-benefit approaches are suggested to offer a rational, inclusive and consensus generating means of addressing complex issues such as rhino poaching and augmenting the information used within the CITES decision-making processes. Poaching of Africa's rhinos has escalated exponentially from an average loss of 0.17 rhinos per day (a total of 62 rhinos) in 2007, to 2.04 rhinos per day (a total of 745 rhinos) in 2012.1 This escalation has raised concerns amongst conservationists about the long-term survival of the species.2 South Africa, with 82% (or 20 954 rhinos) of the continent's rhino population, has been most affected by poaching, losing 1805 (or 75%) of the 2387 rhino poached since 2006.3 Of particular concern is the 1.75-fold (+0.64 s.d. ; n=5) increase in the annual rate of poaching, which accounts for 3.2% of the South African rhino population size in 2012. Although this loss is currently sustainable, it is predicted that South Africa's rhino population will start to decline by 2015-20161,4 if the increasing rate of poaching is not quickly addressed. Kenya and Zimbabwe lost 2.2% and 4.1%, respectively, of their rhino populations in 2012; Namibia was much lower amongst the four major African range states, with a loss of 0.04%.2 The eight remaining minor rhino range states, which collectively conserve about 500 rhinos, had losses in 2012 ranging from 0% in Swaziland to 100% in Mozambique,3 indicative that poaching is affecting the entire African continent. The challenge is that these evaluations cannot be made using only biological information; there is a need to move beyond traditional debates and decisions11,20 that have to date only considered two strategies: (1) no trade in raw rhino horn with an associated intense law enforcement campaign and (2) unrestricted trade in raw rhino horn. We report on the outcome of a workshop involving a variety of experts to collectively identify and evaluate alternative strategies, focusing on rhino horn as a commodity, and making use of a basic conceptual model of drivers influencing demand and supply.17 The aims of the exercise were to (1) achieve a consensus understanding regarding potential drivers of rhino poaching by considering common economic theories and opinions, (2) identify a suite of alternative management strategies, irrespective of present legal constraints, by collating existing proposals and adapting or proposing new ones, (3) evaluate the risks and benefits of each management strategy for rhino persistence within South Africa, Africa and Asia, as well as for other conservation values, economic values and societal expectations and (4) recommend consensus21 best-practice management strategies. A total of 45 experts were invited, of whom 30 participated. The participants had expert interest and experience across a broad spectrum of fields including traditional (n=1) and resource economics (3), law (2), enforcement and compliance (9), conservation science (11) and ethics (4). In addition, the attendees had a common interest in rhinos and were representative of various value systems associated with conservation (10), animal welfare (2), animal rights (2), national (7) and provincial government (4) and private rhino ownership (5). We provided a brief overview on rhino conservation status1 as well as an introduction to the requirements for innovative thinking,17 given that present approaches have apparently had limited success in curbing the incentives for rhino poaching.4 To ensure that we had a wide spectrum of viewpoints represented, we asked participants to express their expectations from the workshop and categorised these into 19 categories. The authors remained independent in facilitating the process of the assessment. Following a participatory objective setting process,22 participants collectively agreed on a list of rhino conservation objectives, along with their expected challenges and costs. Differential effects can only be evaluated within a common understanding of how various factors may interact and influence rhino poaching. Participants were introduced to risk-benefit approaches for evaluating various management strategies23,24 (Box 1). 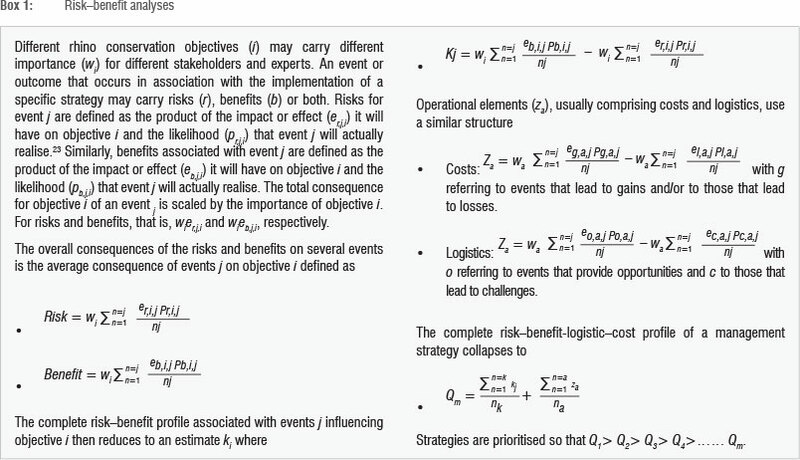 Traditional risk methodology23 focuses on describing all events or outcomes associated with a strategy as risks, whether these have positive or negative consequences. This approach is challenging in participatory workshop processes and discussions tend to provide clarity when participants have a reference framework of risks and benefits. Our approach thus accommodated this aspect. The group agreed to use the integrated framework approach17 in understanding the complexities associated with the relationship between the supply and demand for rhino horn, and aimed to develop a common understanding of how this relationship potentially influenced the price of horn and the incentive to poach rhinos. In order to potentially meet the agreed rhino conservation objectives, participants proposed a number of alternative management strategies. These strategies were grouped into those that primarily attempted to reduce the demand for rhino horn, affect the supply of rhino horn or both. This approach allowed strategically aligned strategies to be identified and grouped and then evaluated through a risk-benefit analysis. Potential outcomes or developments (such as an increase in poaching or an increase in the number of populations) associated with each objective were identified by participants in a participatory manner as being either a risk or benefit in delivering on the objectives. Each outcome or development was assessed in a spreadsheet model in terms of its possible impact, likelihood of occurrence and certainty of happening, following the scoring shown in Table 1. The 30 participants collectively listed various outcomes or developments for a specific scenario and then, following a discussion, a consensus was reached and scores assigned. Impact relates to the extent of an outcome's perceived effect on the objective. Likelihood provides a scoring for the possibility that the outcome or development will occur, while the certainty provides an indication of the confidence of it actually occurring. Risks were assessed in relation to the negative outcomes, while benefits focused on the positive outcomes. 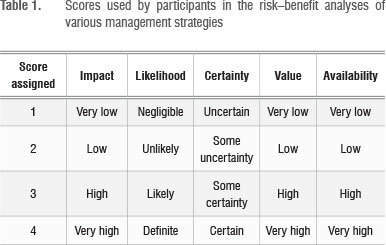 Participants defined the relative importance of each objective, used in weighting components, at the end of the risk-benefit analyses of the various management strategies following the same collective discussion approach as for scoring risks and benefits. As part of the analyses, each strategy was assessed for its logistical costs (challenges) and benefits (opportunities). In addition, the relative financial resources required for or generated in delivering on a specific strategy were also estimated by the group (see Box 1 for details). Participants (n=30) had a broad diversity of expectations in relation to addressing current rhino management issues. 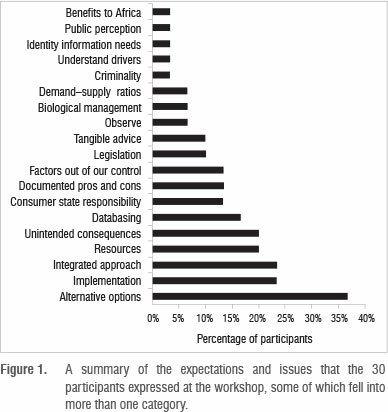 Importantly, 37% of participants appreciated the need to explore alternative rhino conservation strategies, with 24% advocating the need for an integrated approach (Figure 1). Participants identified six objectives that should be achieved through management strategies (Table 2). Four of these objectives have strong conservation outcomes; one gives recognition to economic values associated with rhinos from the direct and indirect values attributed to both the horn and live rhino markets; and the last considers the values of stakeholders both in range as well as in consumer states. The group weighted the objectives with regard to their perceived relative importance. 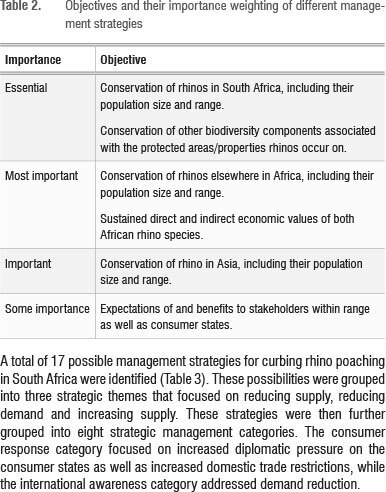 A total of 17 possible management strategies for curbing rhino poaching in South Africa were identified (Table 3). These possibilities were grouped into three strategic themes that focused on reducing supply, reducing demand and increasing supply. These strategies were then further grouped into eight strategic management categories. The consumer response category focused on increased diplomatic pressure on the consumer states as well as increased domestic trade restrictions, while the international awareness category addressed demand reduction. A total of six suggested detailed strategies were more focused on restricting the supply of horn to the illegal market. Half of these were more directed at providing for disincentives to criminal involvement in the trade in horn, such as through enhanced law enforcement, while the remaining three - such as the creation of rhino horn alternatives or dehorning animals - were considered indirect approaches aimed at restricting the supply of horn. Eight detailed strategies were focused on increasing the supply of rhino horn to the market, through direct donations, provision of live rhinos, and restricted or unrestricted trade in rhino horn. A total of five different detailed strategies from across the spectrum of management categories were selected for the analysis. Each strategy, along with the mechanism through which it was thought to work, is described below. 1. Direct disincentives to poaching through increased local law enforcement (the status quo): This strategy is maintaining the current status quo in which the ban on the trade in horn nationally and internationally is retained and for which there are slightly improved law enforcement and anti-poaching efforts and associated intelligence gathering in the range states. The primary focus of this strategy is to curb poaching through disrupting criminal syndicates and providing direct disincentives for poaching. This approach is the basis for numerous current fundraising initiatives. The strategy is suggested to reduce the availability of rhino horn through local law enforcement and intense anti-poaching programmes. It aims to discourage poaching by increasing the risk of being arrested and prosecuted. With a restriction on supply of horn, but no concomitant reduction in demand in the consumer states, the price of rhino horn is expected to rise, increasing further poaching pressure. 2. Increased international awareness (demand reduction): This strategy is the same as the above status quo situation, but includes an intensification of awareness and government law enforcement interventions in consumer states to reduce the use of rhino horn. This approach also targets conduit states through diplomatic awareness. Substitution with alternative products and increased enforcement in consumer states may form part of this approach, but were considered to be relatively minor components. This strategy was suggested to reduce the demand for rhino horn, and along with a shrinkage in supply, there would be a reduction in the price of horn and a subsequent reduction in the incentive to poach. There was some uncertainty as to whether differential rates in the shrinkage of supply and reduction in demand may affect the price of horn and the incentive to poach. This strategy is currently being widely advocated. This strategy involves providing live rhinos to consumer states through international trade. Harvesting of horns from these ex-situ rhino populations would be permitted. It also includes the status quo scenario plus a ban on both domestic and international trade in rhino horn in range states. It envisages the trade being compliant with current CITES (the Convention on International Trade in Endangered Species of Wild Fauna and Flora) restrictions, but with consumer states allowing domestic trade in horn products derived from local harvesting. The strategy proposed here assumes a leasing agreement for the rhinos (i.e. involves a financial return to the lessor) and benefit sharing (50:50) between range and consumer states. To avoid genetic contamination of South African rhino populations, no progeny would be allowed to return to South Africa. Effectively this strategy provides for parts of the rhino horn market. With a greater reliable supply of horn to the market, the price is expected to decline, thus reducing the incentive to poach. The associated harvesting of horn may not be able to provide for certain markets because of cultural preference of horn originating from free-ranging rhino, thereby limiting impact on demand-supply dynamics. This strategy also carries considerable uncertainty regarding the possible effects of achieving the conservation objectives. 4. Restricted trade in rhino horn: In this scenario the national moratorium on the trade in horn in South Africa would be lifted, allowing only for domestic trade. This strategy is expected to lead to the stockpiling of rhino horn. Participants essentially considered this strategy as a stepping stone to international trade. The strategy envisages a well-regulated and controlled internal trade with appropriate database management and reporting being in place. Effectively this strategy provides for parts of the rhino horn market, albeit only locally in South Africa. Sales and expansion of the rhino range in South Africa were expected. This strategy is anticipated to have limited positive impact on the global demand-supply dynamics, and thus limited influence on the price of rhino horn and hence incentives to reduce poaching. 5. Unrestricted trade in rhino horn: This strategy allows for the international trade in rhino horn. The approach includes the situation described in the status quo strategy above, plus a well-regulated domestic trade in rhino horn within South Africa along with the required law enforcement and compliance mechanisms. Harvested horn from dehorned rhino plus stockpiled horn from natural deaths in both private and state populations would be allowed to be sold. The approach requires a legitimate trading partner, as well as compliance with CITES and international systems for tracking and monitoring of the rhino horn to reduce laundering of illegally obtained horn. A central selling organisation was advocated as the trading mechanism based on free market principles with certified buyers. Effectively this strategy provides for all components of the rhino horn market. It is envisaged that the demand-supply ratio should lead to a drop in the price of horn and a reduction in the incentives for poaching. There was uncertainty around the reduction in the price of horn possibly stimulating further demand from a growing, wealthier Asian middle class, thus maintaining demand and poaching incentives. 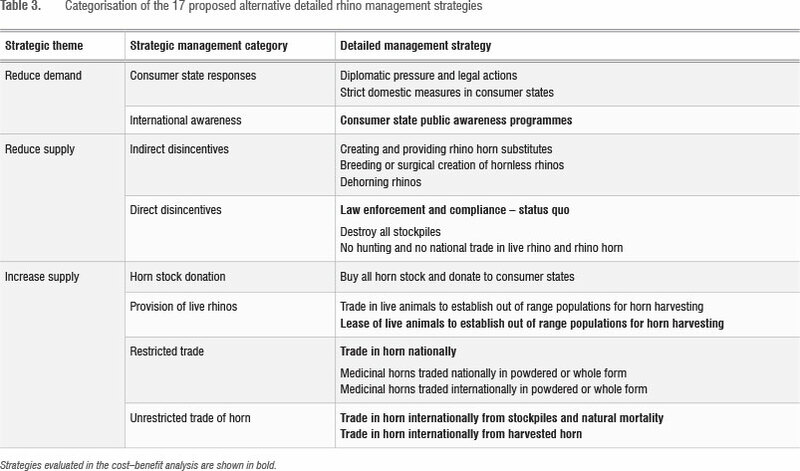 The potential mechanisms by which the six conservation objectives are met and, in turn, affect the demand and supply of rhino horn to the market for each of the five management strategies are described in Table 4. The descriptions include each strategy's logistical challenges and opportunities, and relative financial costs and revenue generation potentials. 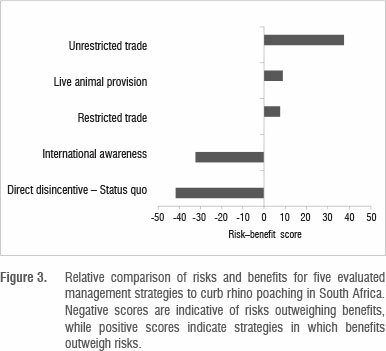 A comparison of the five alternative management strategies (Figure 3) suggests that rhino poaching may be best addressed by management strategies that generate benefits at least equal to or higher than the associated risks involved in the supply of horn to the market. Overall, unrestricted international trade in rhino horn produced the best risk-benefit score, while the worst case scenario, in which risks substantially exceeded benefits, was provided by the status quo strategy. A large part of factual uncertainty stems from opinions, expectations and assumptions not robustly tested by appropriate information. Curbing rhino poaching epitomises such challenges. In the absence of factual certainty, several approaches are used, most notably that of adaptive management.28 In such instances, adaptive management proceeds with some opinion about how a system may be working and implements responses followed by processes allowing learning by doing. The opinions that workshop participants had about responses to curb rhino poaching were translated into predictions through discussions on what the outcomes might be. These discussions reflected many management strategies or options to meet desired outcomes,29 as noted in the wide variety of expectations and options discussed by the workshop participants. The risk-benefit approach thus benefitted from this diversity of opinions towards the agreed central outcome of seeking solutions to curb the escalation in rhino poaching and the need for innovative thinking. Although a potentially large number of management strategies were proposed, the five consolidated strategies that were assessed provided a diversity of approaches to achieving the agreed objectives. In addition, the risk-benefit approach had the value of enticing expert participants to collectively debate and decide upon various issues associated with each strategy,30 thus drawing away from the limited polarised trade/no trade paradigm that has tended to dominate most previous deliberations.14,19 Our results suggest that there were more benefits than risks associated with strategies that increase the supply of horn, but this outcome may be constrained by the limited expertise within the workshop on Asian culture and markets. CITES processes are cumbersome at best7 and often ignore ecological realities.31 Although the provisions of CITES7 are invaluable for achieving sustainable international trade, they are vulnerable to lobbying tactics that distract focus from the conservation and sustainable use agenda. Given the international scope of the illegal trade in rhino horn,5,6 and the dichotomy of conservation philosophies, it would be of value to repeat the risk-benefit approach used in the present study with other range states, and also with the Asian consumer states. The latter would be important in elucidating the understanding of local Asian trade in rhino horn and the international implications of the illegal trade. The importance of the risk-benefit approach would be its non-confrontational and consensus building nature that allows for a common understanding of the details and socio-ecological-economic linkages.32 We envisage that such an approach could draw consumer states in as potential partners for finding a solution to the rhino poaching problem. Risk-benefit approaches may thus provide a useful basis for a participatory consultation process to inform CITES processes and decisions. As many of the decisions dealing with the cause of rhino poaching rely upon an understanding of the economic drivers and processes, any risk-benefit analysis involving all range and consumer states must have a well-informed resource/economics presence in addition to other knowledge areas such as conservation, private rhino ownership, animal ethics, animal welfare, animal rights, law enforcement, Chinese traditional medicinal experts, market analysts, jurisprudence and diplomatic representation. It is clear from the South African workshop that the broader the base of expertise, the more informed the outcome. Disregarding these shortcomings, the conceptual framework17 adopted by participants highlighted three important realisations. Firstly, curbing rhino poaching requires a variety of responses that may have different levels of effectiveness depending on the incentive/disincentive interaction at a specific time. Rhino poaching is an illegal activity driven by the complex interaction between risks and rewards of committing a crime.25 Incentives driven by the international price of rhino horn are relatively simple and tend to increase exponentially as the price of the commodity increases. However, the impacts of disincentives remain more elusive given their broad scope and the variability in their effectiveness at different prices of the commodity. A key challenge arises when the price of rhino horn reaches such high values that incentives outweigh all disincentives. Reactive responses such as enhanced law enforcement and dehorning focus on the symptoms of the problem and will be ineffective, as evidenced by the rhino poaching surge observed during recent years in South Africa.1 In essence, more of the same law enforcement will be in vain. Conservation authorities must be adaptive and switch to more wide reaching solutions that focus on the cause of the problem, such as the demand for horn. Doing so does not mean that basic law enforcement and protection should be discarded. The third realisation is that if rhino range states are to be effective in conserving their rhinos, they need to be decisive and flexible in changing their management approaches. In the short term, authorities are forced to be reactive and focus on the symptoms of rhino poaching in their management responses, which are progressively more demanding, expensive, technically advanced and complex, in an attempt to increase the risk to would-be poachers, a known significant deterrent for crime25 below certain threshold prices for the commodity. The opportunity costs of redirecting such resources away from other conservation activities can be detrimental to other conservation outcomes. Collapsing (or undermining) organised crime links is part of this complexity, while focal awareness campaigns, particularly in Vietnam where new demands have reportedly surfaced,5 can disrupt the exponential cascade of continual increases in rhino horn retail prices. Such disruption of the horn supply chains could provide important respite and allow time to fully explore other broad-based systemic strategies and ways to provide rhino horn when price incentives outweigh all disincentives. Being mindful that our results are dependent upon subjective assessments and understanding, as well as the persuasive powers of participants, the assessment is only indicative; yet it provides important insights to inform an adaptive management approach to addressing this subject. An important product of this process was the identification of potential information gaps, especially those with potentially major impacts for which there were a high degree of uncertainty. 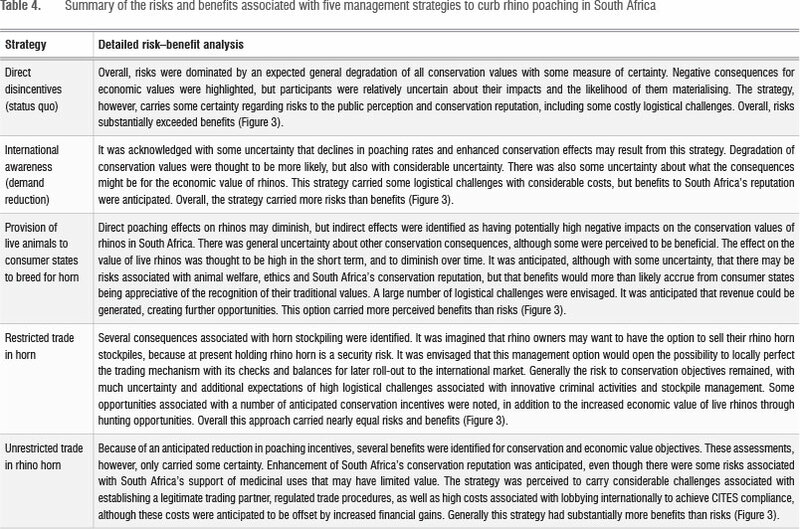 Some of these included the need to: (1) identify the potential opportunity costs to conservation associated with an increase in the supply and/or demand reduction strategies; (2) understand the potential threats and the magnitude of these threats associated with implementing different rhino management strategies on South Africa's reputation; (3) understand the animal rights and welfare issues with regard to live animal trade strategies; (4) understand the international and national legal implications of the different strategies; (5) assess the potential impact that increased supply and demand reduction may have on the potential to increase demand in consumer states; (6) assess the potential impact of local rhino management policies and actions on regional and continental rhino populations; and (7) understand detailed market linkages and drivers of rhino horn consumption in consumer states. Curbing rhino poaching requires integrated and flexible approaches. A restriction in the availability of strategies constrains authorities to respond effectively to the underlying causes of rhino poaching. Conservation authorities are thus forced to engage in progressively more aggressive and costly law enforcement activities to the detriment of other conservation values. Risks and costs of the present status quo management strategy substantially outweighed any benefits and any additional measures to enhance this strategy should be approached with caution. Even the simultaneous application of demand reduction strategies may not reduce the incentive enough to reduce the threat of poaching. South African conservation authorities will remain compromised if short-term pro-active law enforcement activities fail to disrupt organised crime syndicates to reduce poaching and if alternative management options to supply rhino horn within CITES processes do not become readily available. We thank Antoinette Botha (South African National Biodiversity Institute) who very competently made all the logistical arrangements for the expert workshop at short notice. We also thank all the workshop participants. S.M.F. was the project leader; S.M.F., M.H.K and M.P were responsible for workshop design and facilitation; S.M.F. wrote the manuscript and M.H.K and M.P provided conceptual contributions and manuscript revisions. 1. Knight M. African Rhino Specialist Group report. 10th Meeting of the IUCN/ SCC African Rhino Specialist Group. Pachyderm. 2012;52:7-19. 2. Thomas R. Surge in rhinoceros poaching in South Africa. TRAFFIC Bulletin. 2010;23:3. 5. Milliken T, Shaw J. The South Africa - Viet Nam rhino horn trade nexus: A deadly combination of institutional lapses, corrupt wildlife industry professionals and Asian crime syndicates. Johannesburg: TRAFFIC; 2012. 6. Turton C. Review of the trade in rhinoceros horn in Viet Nam. Viet Nam: TRAFFIC Southeast Asia; 2009. 8. 't Sas Rolfes M. The economics of rhino extinction. Endangered Wildlife. 1990;2:4-9. 9. Blecher E, Thomas K, Muradzikwa S, Smith L, De Villiers P Economics. 2nd ed. Cape Town: Oxford University Press; 2010. 15. Knight M. South Africa's rhino success story gets sad new poaching chapter. SWARA. 2011;Oct-Dec:28-32. 16. Fourie R. The rhino moratorium curse. Pretoria: Wildlife Ranching South Africa; 2011. 17. Ferreira SM, Okita-Ouma B. A proposed framework for short-, medium- and long-term responses by range states to curb poaching for African rhino horns. Pachyderm. 2012;51:52-59. 23. Mentis M. Environmental risk management in South Africa. Pretoria: Mike Mentis; 2010.